What a pleasant surprise, not. 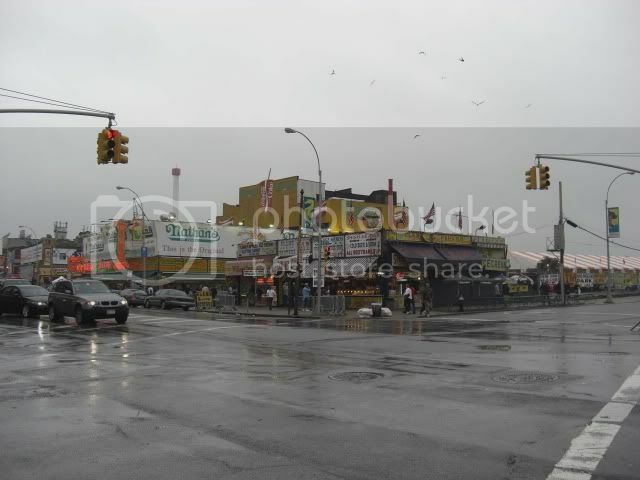 Another gray and rainy day here in Downtown Brooklyn. And yes, it is Downtown Brooklyn, not Brooklyn Heights, no matter what my brother-in-law Jim says. Yes, having Adams/Boerum/Brooklyn Bridge Boulevard, or whatever you call it as the demarcation might make more sense, but it is Court Street, one block away, that is the official boundary. I like to think of myself as a kind of hip, gritty downtown kind of guy but he thinks I am more of a sophisticated, establishment, Brooklyn Heights person. We argue about this endlessly. Be that as it may, the Mysterious Chinese Woman spent the day cleaning while I lounged about drinking red wine and watching The Good, The Bad, And The Ugly for the umpteenth time. Eli Wallach as The Ugly is still my favorite character in that film. Anyway, feeling a bit guilty I decided I should take her out for dinner. We had planned to go to Bar Tabac, and I guess it did look a bit like Paris in the springtime, when it drizzles. 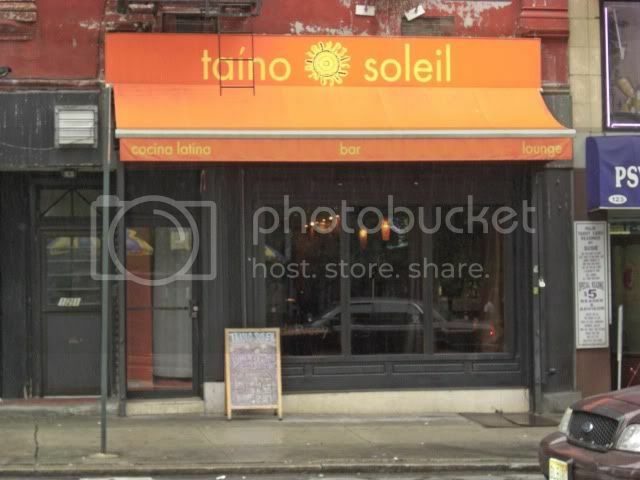 But as we stepped out of the door, the orange awning of taino soleil caught my eye. You can just barely see the awning in the distance, partially blocked by the white van. I have stopped in here for drinks on a few occasions, the last time being on my way home from the Mermaid Parade on Saturday. The friendliness of the bartenders has always impressed me but, for some reason, I have never eaten here. A gray and drizzly day seemed to be the perfect day to go to a place with "soleil" in its name and a picture of the sun on its awning. 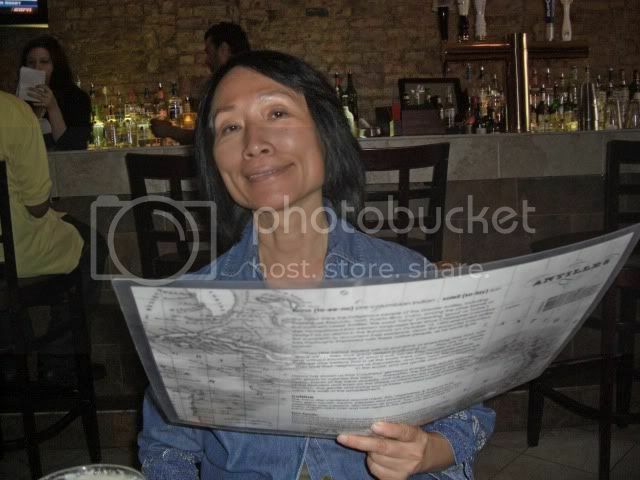 We started out with a couple of beers, Brooklyn Lager on draft, and perused the menu. Next time I come in here, and I will come in here again, I will read the back. It looks interesting. Their menu has a Latin American, bent to it. Next time I will take notes and share some of the offerings with you. Well, I will share the names and descriptions with you. I will eat the offerings myself. We started out with a shrimp cerviche. It was a bit on the small size, particularly compared to the huge ones I get in Puerto Vallarta, but it was very good. 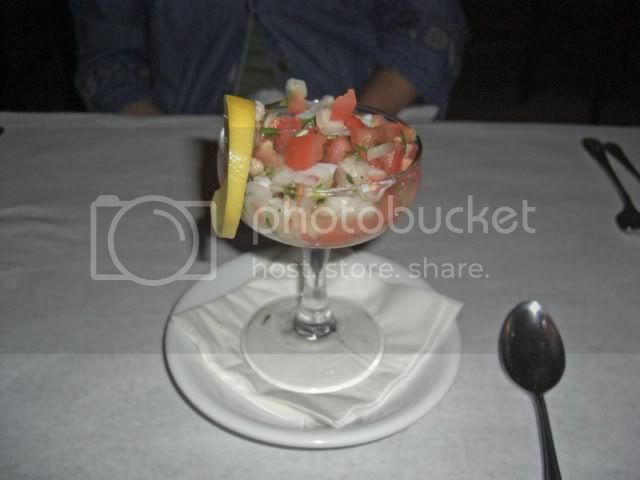 The shrimp cerviche was the only portion that was small, however. 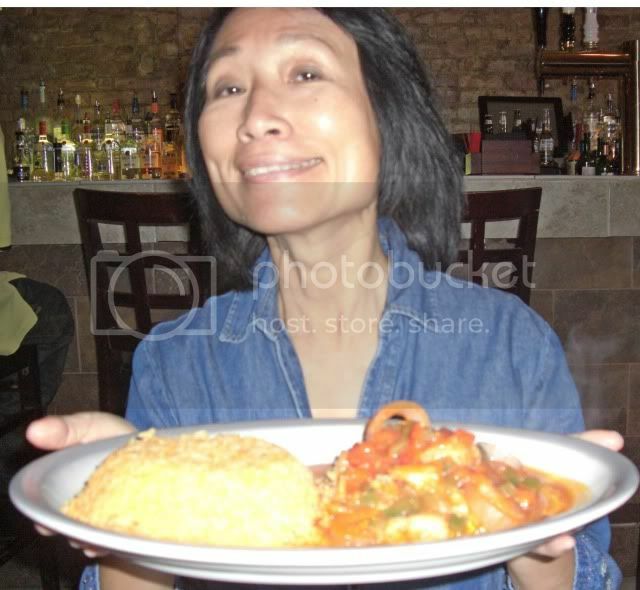 The Mysterious Chinese Woman ordered a salt cod stew of some kind and her portion was most generous and came with a large portion of yellow rice. We ended up taking half of it home. I am not sure why I ordered what a did, but for some reason I decided to have the Cubana Sandwich. It was very good, but a bit different than the ones I have had in Miami. It wasn't pressed, that was the biggest difference. But that was fine, the bread was very good. Crunchy crust but chewy inside. I will have to ask them where they get it. It reminded me of the hamburger buns at the Waterfront Ale House. 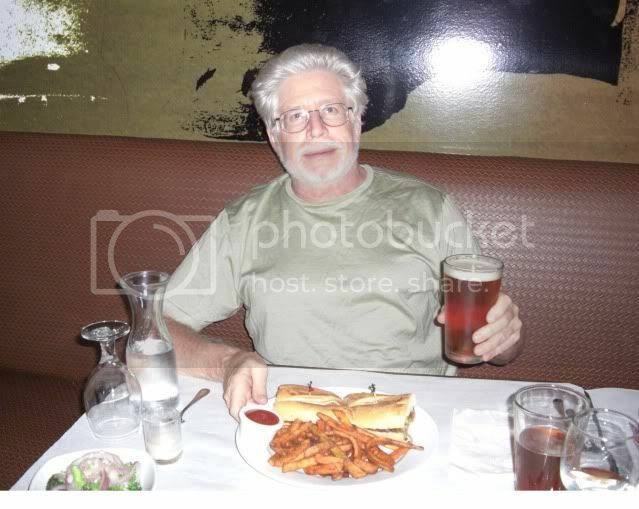 I had the sweet potato fries as a side and we took some of those home too. I should have taken half the sandwich as well. I was full after only half of it, but it was so good I ended up finishing it off. My only complaint about the sandwich was that I thought it could use more pickles. I mentioned this to the waitress and she said next time I should just ask for some on the side and then I could have as many as I wanted. And that is what I will do. Our dinner, with three beers (two for me and one for the Mysterious Chinese Woman) including a decent tip was $60. And I consider it to have been money well spent. Of course I didn't get out of there spending only sixty bucks. Just as I was about to leave an old friend of mine, Carlos, came in and sat down at the bar. He is one of the guys that I used to drink with when the little bar at the back of the now long-gone Chinese restaurant, Szechuan Cusine. was kind of a favorite hangout of mine. 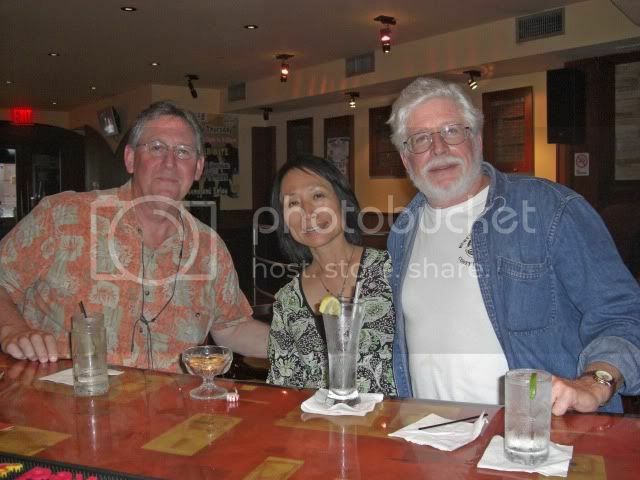 I had to have a couple drinks with him at the bar and talk over old times and current events. All and all a most pleasant day. Probably a bit less so for the Mysterious Chinese Woman. You know, the cleaning and all. This place would have been better off advertising rain-gear, sweatshirts and jackets. No matter how you looked at it, it was one hell of a gloomy day. Even the few paraders who straggled by our neck of the woods looked, well, damp. 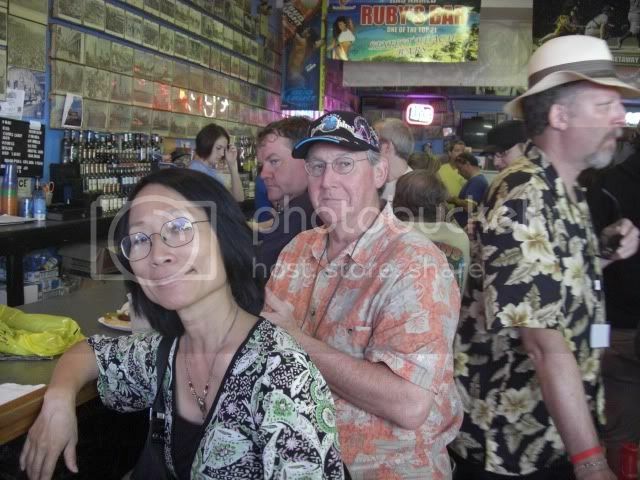 Most of the action seemed to take place in and around Ruby's. These two weren't in the parade, but they should have been. Even mermaids gots to eat. 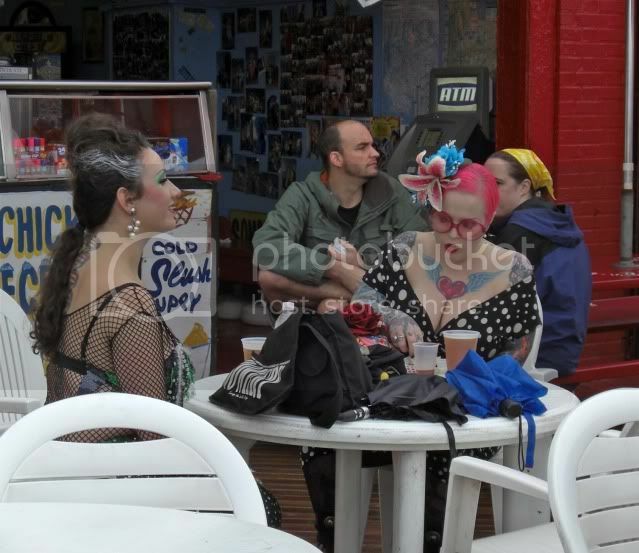 I had to ask what these costumes had to do with a Mermaid Parade. 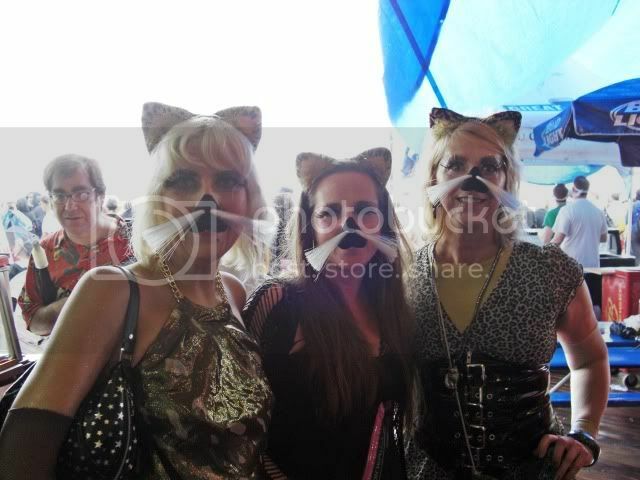 I was told they were catfish. Well, bad weather outside made for a good crowd inside. 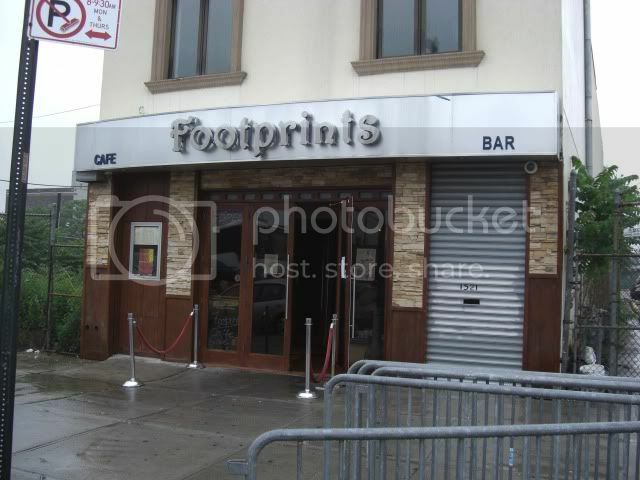 We probably would have spent more time in Ruby's, but the long lines at the single toilet coupled with the privilege of paying a dollar to piss drove us to Footprints. 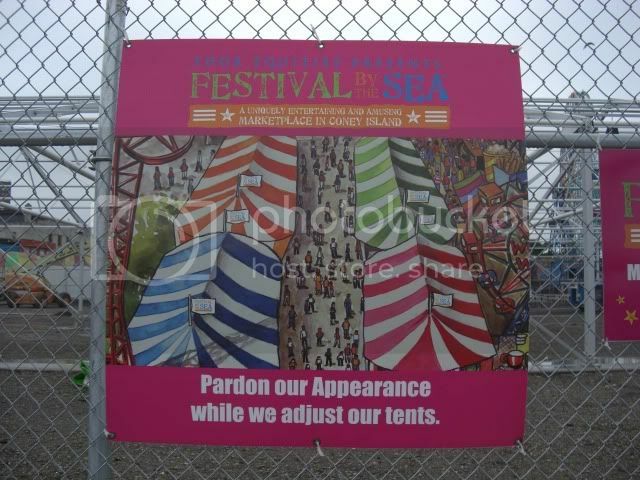 As we headed that way we passed this colorful poster advertising the Festival By The Sea. 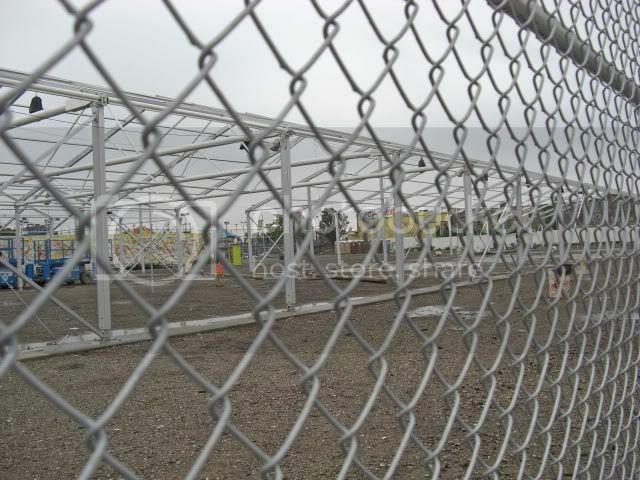 Just another of the fiascos around the redevelopment of Coney Island. This was supposed to have started mid-May. And here is where it stands, well past mid-June. 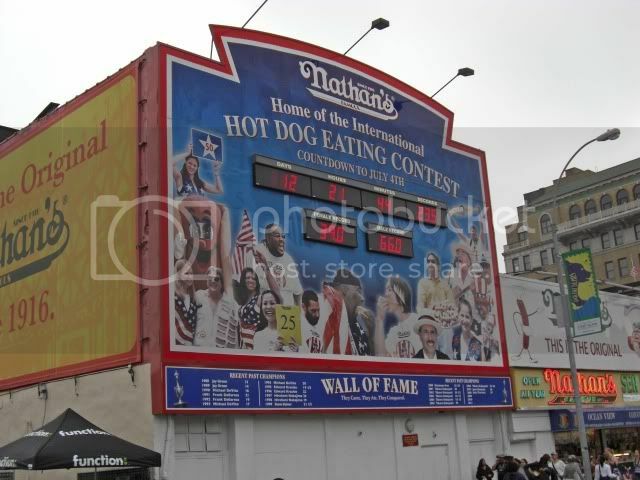 Oh well, one can always look forward to the Hot Dog Eating Contest. You can be sure that will take place as scheduled. At least this place wasn't crowded. The bathrooms were nice, no lines, and you didn't have to pay to pee. 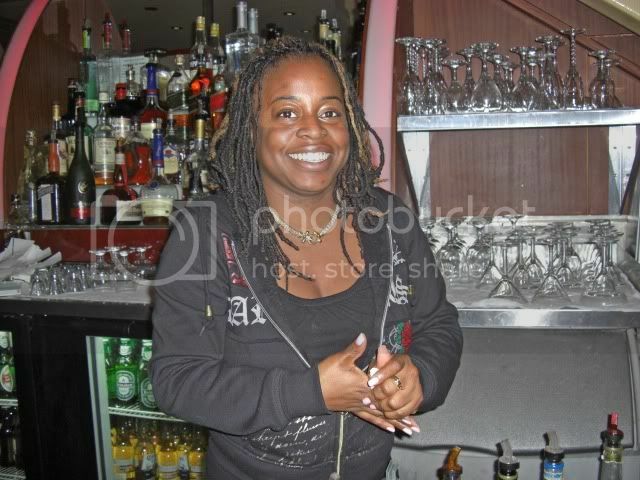 Our lovely bartender, "T," took care of our needs. Sorry to say, however, the food today was not up to it's normal quality. I hope it was just a one time aberration because I sure would hate it if it wasn't. The fishcakes were mostly non-fish filler and I would bet my bottom dollar they were a commercially frozen product. Last time they were mostly fish and were made on the premises, as their menu promises. The shrimp appetizer that we had was okay and only suffered in comparison to previous visits. I will be giving the place another visit later in the year, and I am keeping my fingers crossed. 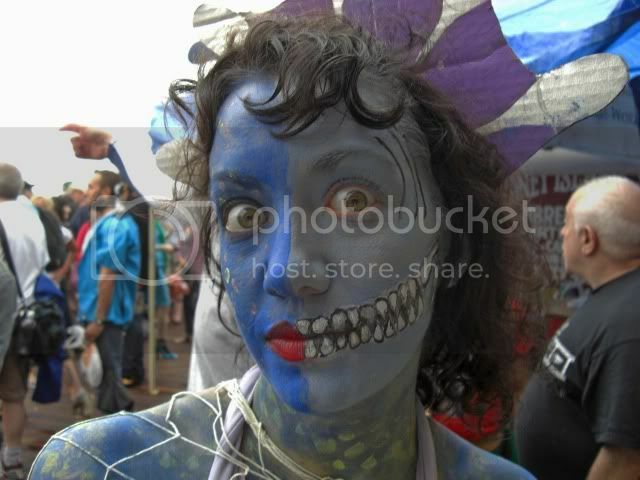 More pictures of the Mermaid Parade will have to wait until tomorrow. I got kind of sidetracked today and I couldn't even tell you how. Oh yeah, leveling Deekaa, my Death Knight, from 75 to 76 took up a good chunk of my time. But I thought I would pass on a couple of interesting coincidences. First one; as we were heading out after the Mermaid Parade on Saturday my friend Allen, who was staying overnight in Manhattan, said he might take the subway into Brooklyn on Sunday so we could stop at Montero's on Atlantic Avenue. I said great, I was up for that. We could chat with Pilar who is usually there reading the Sunday papers and drinking her glass of white wine. Well, Allen got a couple of emails from his kids who wanted to see their daddy for Father's day so he cancelled. The Mysterious Chinese Woman went to a concert with a friend of her's late Sunday afternoon and when she came home we went to Queen for dinner. Who was sitting at the table by the window when we walked in? None other than Pilar with some family members. We chatted a bit and I told her how it must have been destiny that I would see her that day. 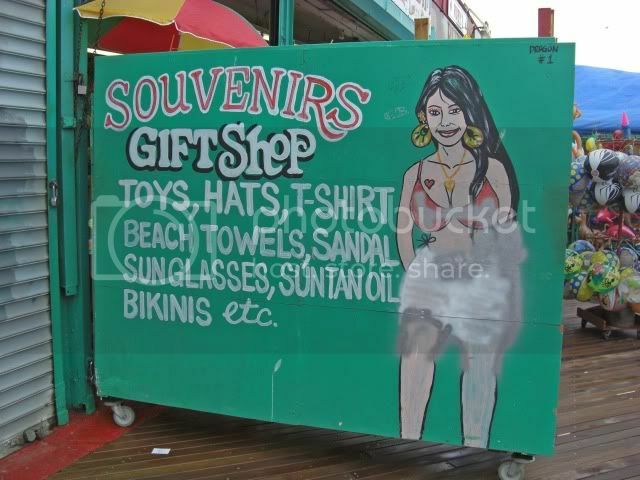 Strangest thing, that is the only time I have ever seen Pilar anywhere other than in Montero's. Second coincidence; my niece Katie just posted a blog about her three-week kayak adventure and mentioned some silly awards that were given out when it was over. One guy got a Surfin' Bird award because he sang the song all the time on the trip. I posted a comment on her blog telling her that she should let Danny know that her uncle (that would be me) knew Tony Andreason, one of the members of the Trashmen, from Patrick Henry high school in Minneapolis. In fact we both played string bass in the high school orchestra. Now the Trashmen were a 1960's group and I hadn't heard anything about them for at least thirty years, although I did know that Tony played occasionally in clubs in Minneapolis. Well, just to double check on the spelling of Tony's last name I Googled them. You could have knocked me over with a feather, they are currently touring in Europe. And, their first stop back in the United States is at Southpaw, a club within walking distance of where I live. Needless to say, I immediately got online and bought tickets for their show. This was like, when out of the blue, I played a couple of Spider John Koerner albums one night and the next day opened up the free weekend edition of am Today and saw that he was playing the very next weekend at a club that I could walk to. And Spider John is someone I knew from way back in Minneapolis. Then, after seeing him and having a drink with him at the bar next door to where he played, I stopped into Montero's on the way home. Kind of one of those strange loops. Man, another gray and rainy day, with no end in sight. The forecast all the way up through next weekend calls for overcast skies and rain every day. The only break in the consistent gray dampness is the possibility of lightning flashes later in the week when thunderstorms are expected. Whoopie. 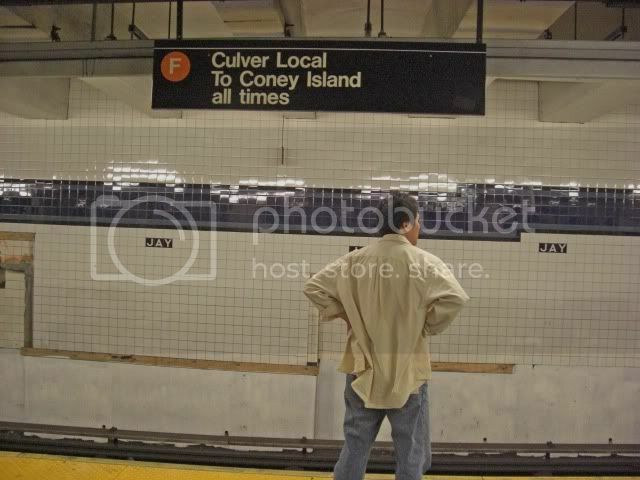 Undeterred by the lousy weather, the Mysterious Chinese Woman and I bravely headed to the subway where we began our trek to Coney Island. And what a trip it was. This group was obviously on the way to be in the parade and getting ready by applying their makeup and doing stretching exercises. We weren't exactly greeted by a cheerful beach scene. 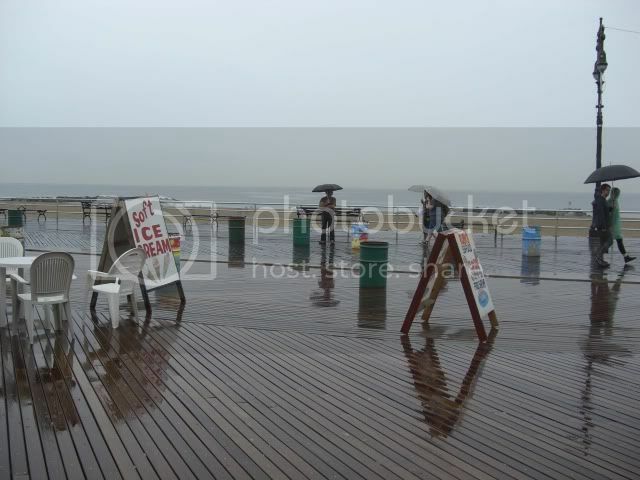 Coney Island is always a bit gritty, but this was downright depressing. Especially when you consider that it was only one day before the official start of summer. And the beach wasn't much better. 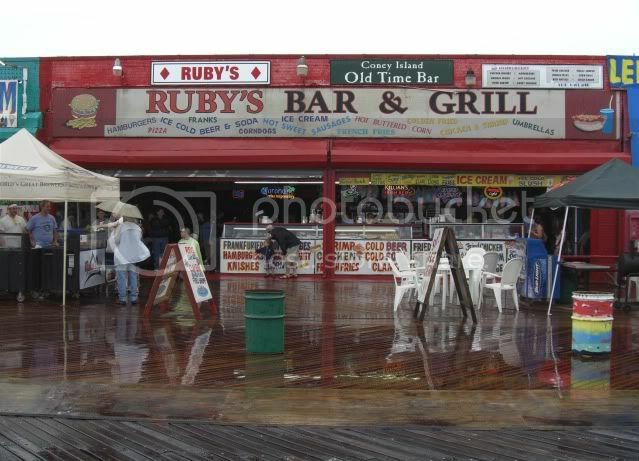 Even Ruby's didn't look all that inviting, and that is really saying something. Well, you do the best that you can do, and drinking beer at Ruby's isn't doing bad at all. 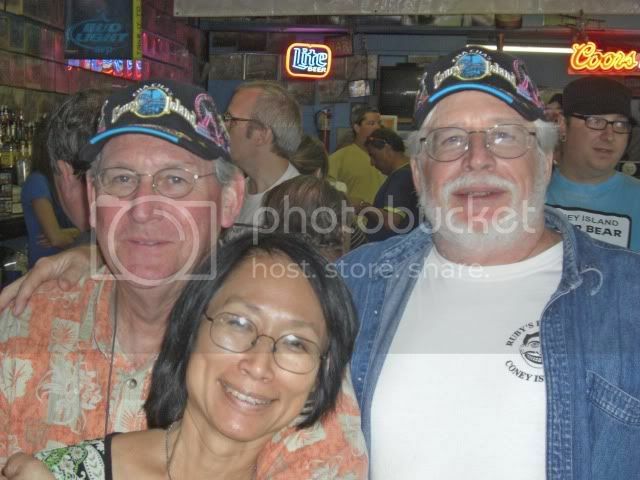 And, after my friend Allen showed up and we had a few more beers, the day started to look a bit brighter. Eventually, the parade started to dribble by. There weren't nearly as many people in the parade as in years past and there were huge gaps between the groups in the parade. 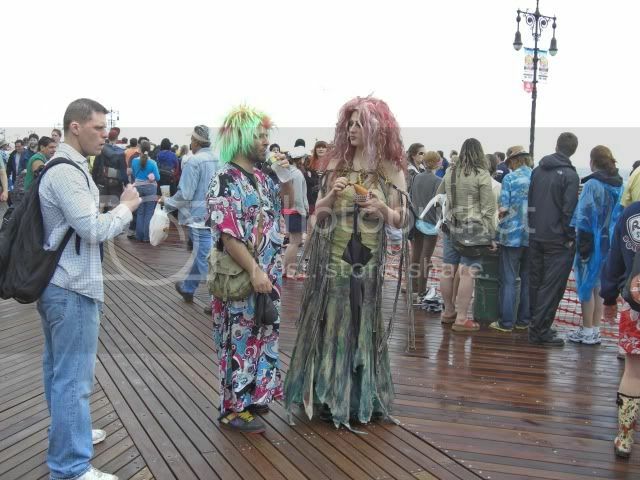 I couldn't understand why because I have been to the Mermaid Parade in the past when it was raining, and it didn't seem to deter anyone. I finally asked about it and found out the reason. They extended the parade route this year and when it reached the point where it turned and went to the boardwalk most groups thought the parade had ended. The majority of the groups in the parade just dropped out and never made it to the boardwalk at all. Very disappointing. There were still a few people in costume wandering around. This gal gave me quite a start when I first spied here. Okay, so it wasn't the best Mermaid Parade I ever went to. But there were a few more things that I took umbrage with. 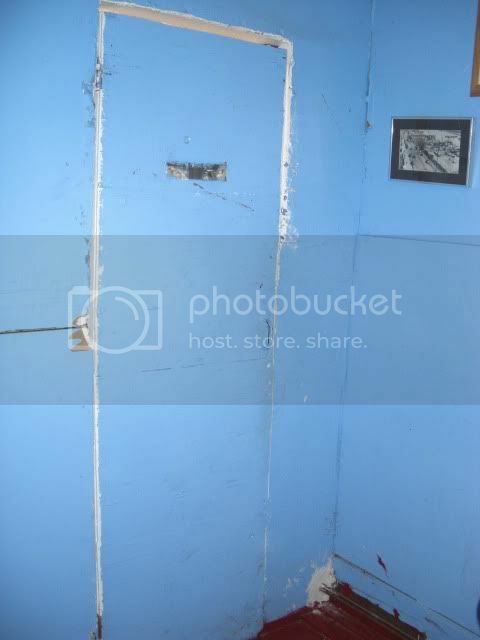 And what was on the other side of the door that you had to pay a dollar to go through? 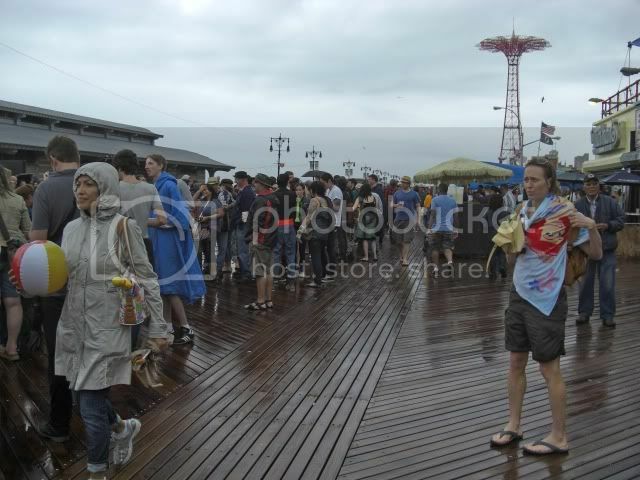 Okay, granted that Ruby's draws a larger than usual crowd for the Mermaid Parade. Maybe they can even justify raising the price of their drinks by a dollar or two, which they did. But $7 for a Sam Adam's is a bit much, in my opinion. 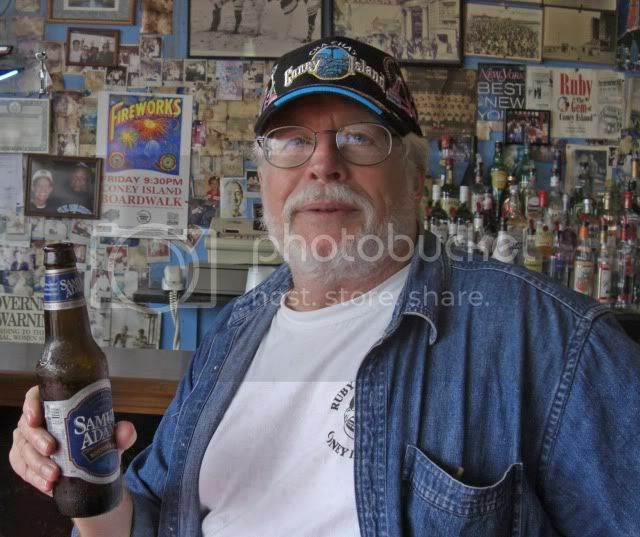 I revisited my blog about this place that I put up in 2005, and at that time a Budweiser was $3. Yesterday it was double that. But to charge your customers a dollar to use the bathroom? Is that even legal? 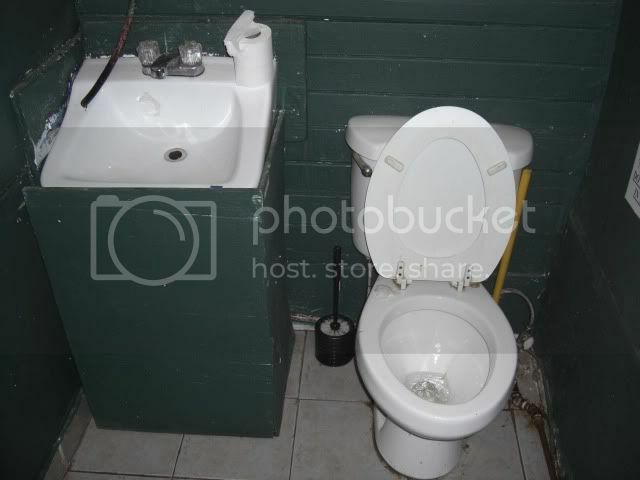 Aren't bars and restaurants required, by law, to provide bathroom facilities for their customers? Cha Cha's even had a sign outside saying that their bathrooms were out of order to discourage people from using them. And, of course, their bathrooms weren't really out of order at all. I can understand a policy of bathrooms being for customers only; fair enough. But to not provide bathroom facilities at all, or to charge your customers a dollar to use them; totally unacceptable. I did manage to take a few more pictures while I was here, and we did hit Footprints later on, so I will be posting more about this somewhat dismal day tomorrow.